My favourite writing tools are usually Uni-style multi-catridge pens and waterproof pigment ink pens. However, they can easily be acquired in Taiwan for an affordable price, so I’m definitely looking for something unusual. Pilot Coleto is stepping up to the multi-cartridge pen game by consistently coming out with beautiful pen body designs. My sister swiped away the popcorn pattern before I have a chance to take a photo of it, but I love the toast and egg pattern as well. The Cocoiro pen is useful for practicing lettering because it has a flexible felt-tip nib. I decided to get the cute Rilakkuma mechanical pencil from Dr. Grip because of my sister’s raving praise. I don’t use mechanical pencil much now a days, but it is always cute to have such a cute pen in your pen case. I own two sets of Zebra Mildliner highlighters already, but I found these selling separately for a very fair price at Shimojima, so I decided to get them to complete my collection. Finally, the last two pens are just experimental pens I’d like to try using in my daily diary. 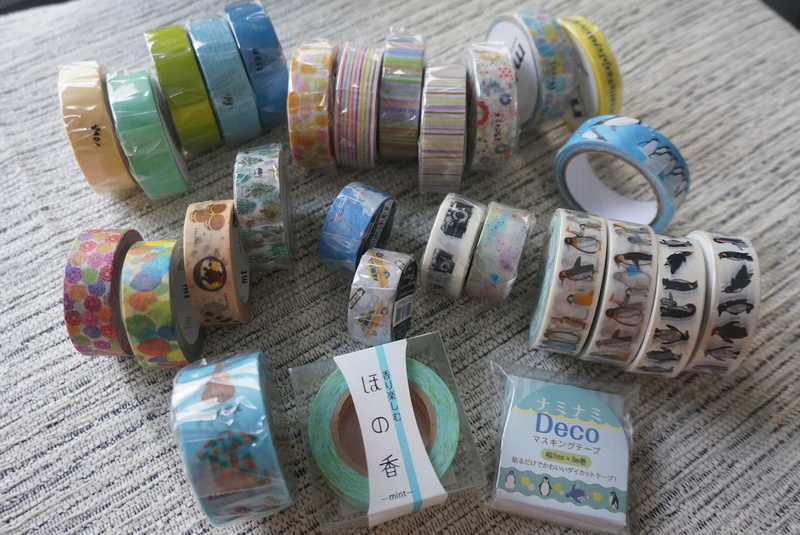 The permanent marker could be a great pen to use for writing on washi tape! 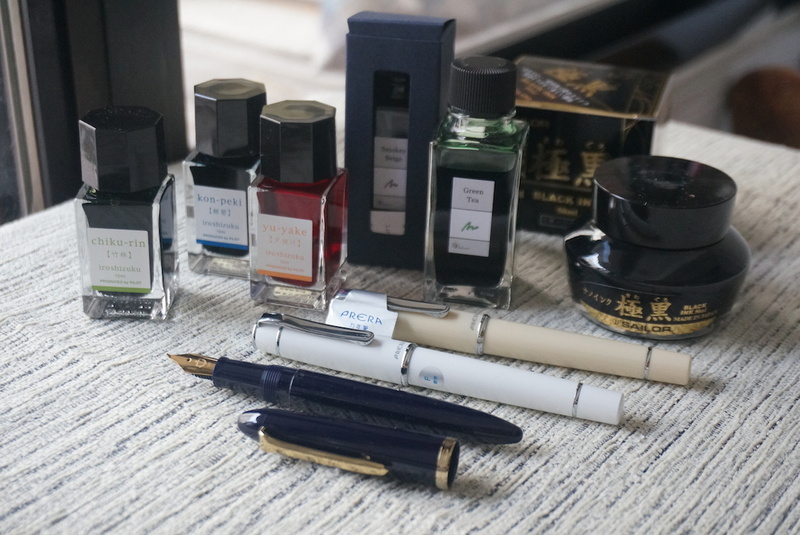 Coming to Tokyo, I already have my eyes set on the Pilot Iroshizuku and Kakimori original ink! 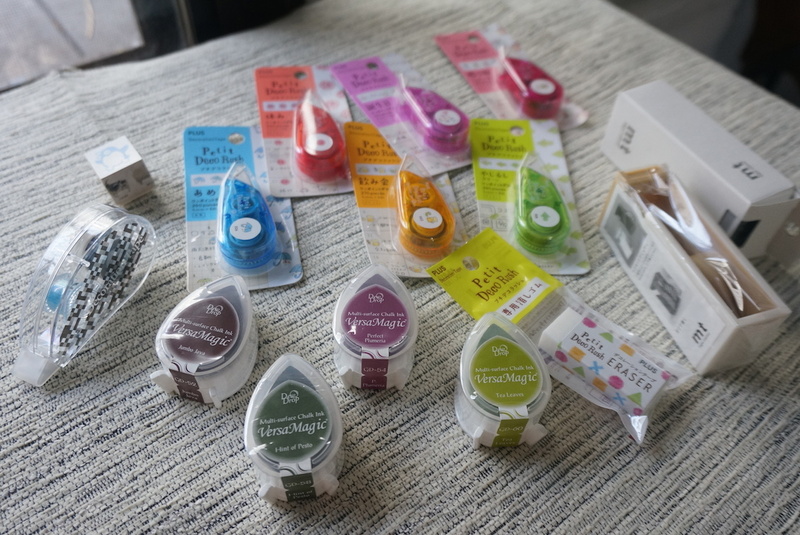 Sekaido sells the 15ml Iroshizuku ink in sets of three, and after the discount, they are guaranteed to have the best deal. My Kakimori conquest was Green Tea and Smokey Beige, a deep forest green and rusty brownish grey. I finally found the Pilot Prera fountain pens in white and ivory. I prefer the F Nibs because they allow me to writing much smaller in my Hobonichi. I also decided to invest in a calligraphy foundation pen (the nib was tilted to create thin and thicker lines) after watching fellow urban sketcher friends using it to quickly sketch outlines of the scenes. Many washi paper materials are too fibrous to use with fountain pen, but I find that these letter pads from Daiso handle my fountain pens well! 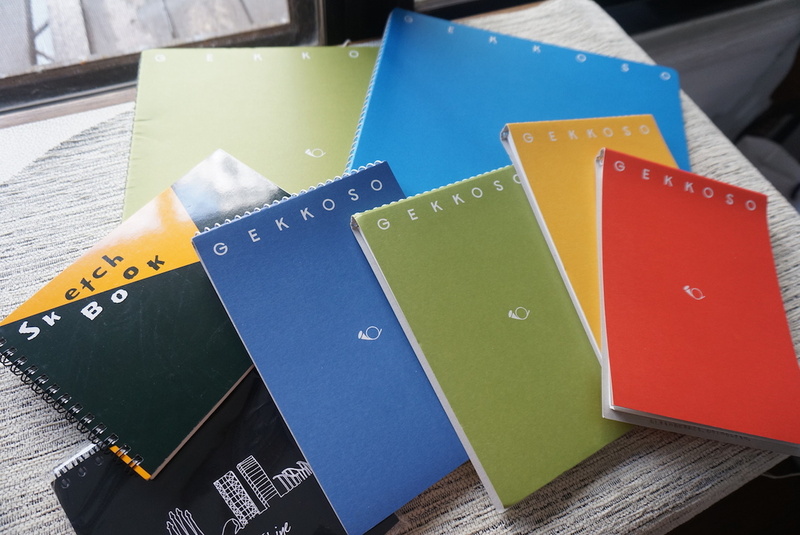 I read about Gekkoso’s art supply products through stationery magazines. Located in Ginza, their sketchbooks are famous for the colourful covers and the variety of paper material for different kinds of drawing. I mainly got the type of paper for water-colour drawings. They come in various size as well! 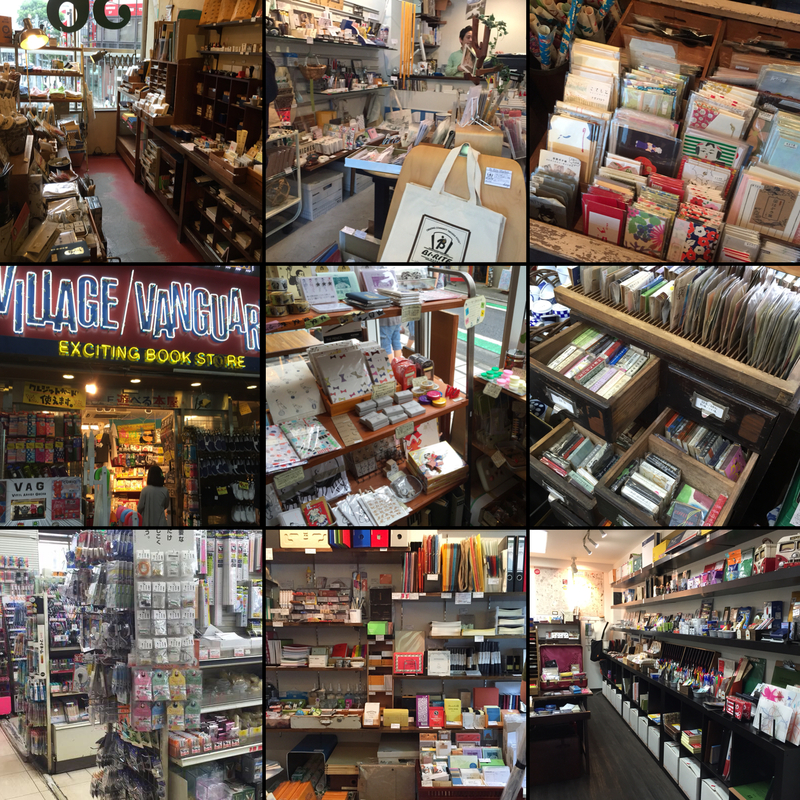 Many small stationery boutiques around Tokyo carry the smaller size sketchbooks, but you really have to go to their main store to find a larger choice of papers. Of course on this trip I cannot miss out the small stationery accessories to use with planners and journaling. One of the most interesting item is the Pentone, which is post-it fusen inside a plastic pen-stick so that you can carry it easily in your pencil case! The material is thin and easy to write on with any pen. They even won first place for the most innovative stationery item in this years International Stationery fair. The Stipee label stickers are made of sturdy plastic and reusable as well. The black and sophisticated Mnemosyne notebooks are a favourite among Japanese salarymen. They come in various sizes and sport quality paper for fountain pen. The A6 size ringed booklet has the format of a to-do list for each day. Although most of my notebooks are black and practical looking, I still can’t resist colourful stationery accessories. Plus came out with a new item: Petit Deco Rush. They sport cute drawings and patterns that you can use in your planners. They are tiny, not longer than my pinky finger. I plan to use them to mark the weather, holiday, and important points on my monthly schedule! You can also buy the Deco Rush eraser to erase the markings if you wish. The Versa Magic Chalk ink are also part of my wish list. They are vibrant in color and can be stamped on many types of surfaces. The best part about them is that they don’t bleed through the Hobonichi! Stickers, stickers, stickers! Need I say more? Most of these are from Tokyu Hands, Seikado, and Daiso. It has become a hobby to collect small table top toys and use them when photographing my hobonichi pages. In the more unique stationery boutiques in Japan, you can find tiny figurines or items that can be adorable additions to your table top. The traffic cone and Postal box are actually stamps in disguise. 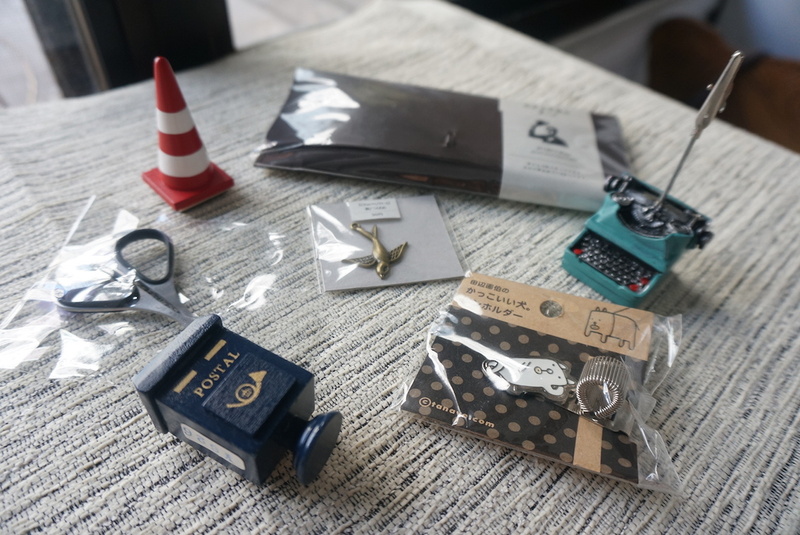 The vintage typewriting memo clip is a gem I found deep inside Nakano in a stationery store called Tabiya. I also bought their signature leather items: A chocolate brown pen case with leather wrap. These concombre figurines from Decole are popping up all over Instagram pages these days. I can’t help but get a few for myself, especially these cute and relaxed penguins. 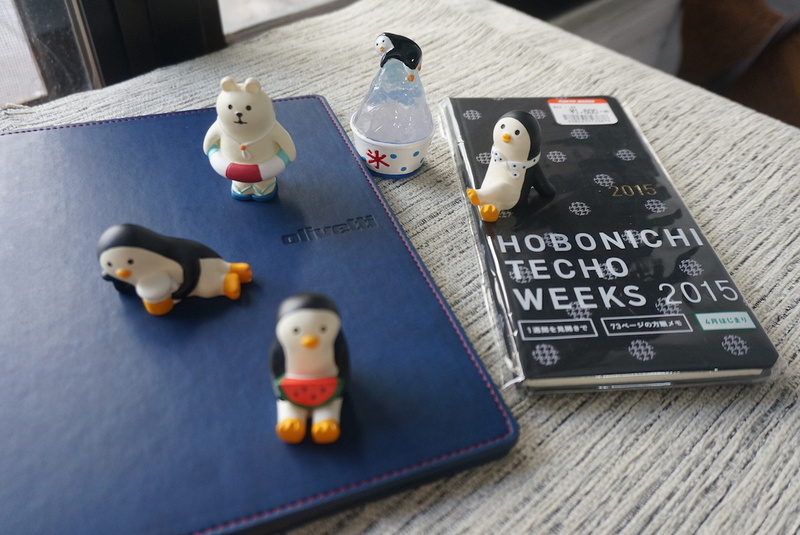 You can see them resting on my new Hobonichi weeks (which was in discounted price…), and the Olivetti faux leather A5 file folder. There are many art supply stores in Japan, and their prices are much friendlier than those we find in Taiwan. 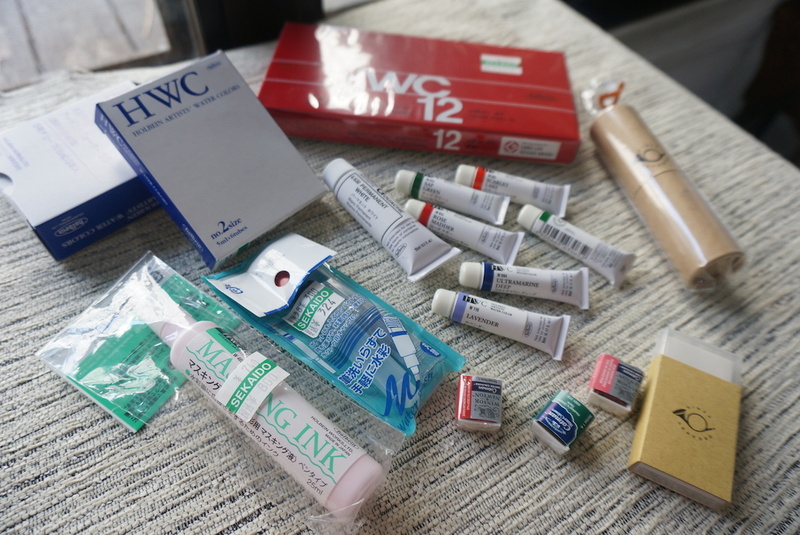 I stocked up on some Holbein water-colour and some Winsor and Newton palette color blocks. The cardboard paper tube contains colouring pencils from Gekkoso. They are super portable and I anticipate using them on my urban sketching trips! Finally, my traveler’s notebook haul is also something to behold. Although I’m not that interested in the blue leather cover (desperately waiting for green), I really like the Penguin fabric bag and the inserts. At Nakameguro’s Traveler’s factory, I bought the special oil TN sold to maintain the leather cover. For normal inserts, I bought them in Tokyu hands because you can get 5% foreigner’s discounts if you show your passport. At Narita Airport’s Traveler’s Factory, there are more goodies: the Hawaiian series 2! I quickly grab the inserts that feature Rainbow Drive as the main theme. 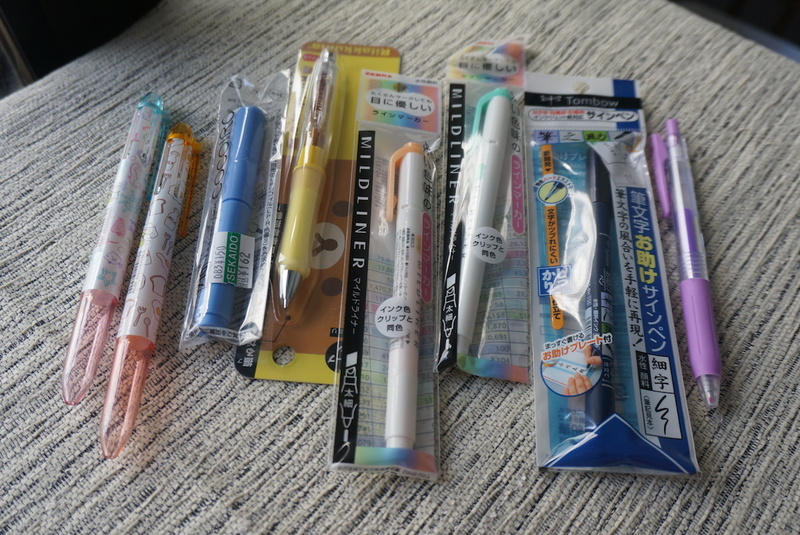 This concludes my Japanese stationery haul post! 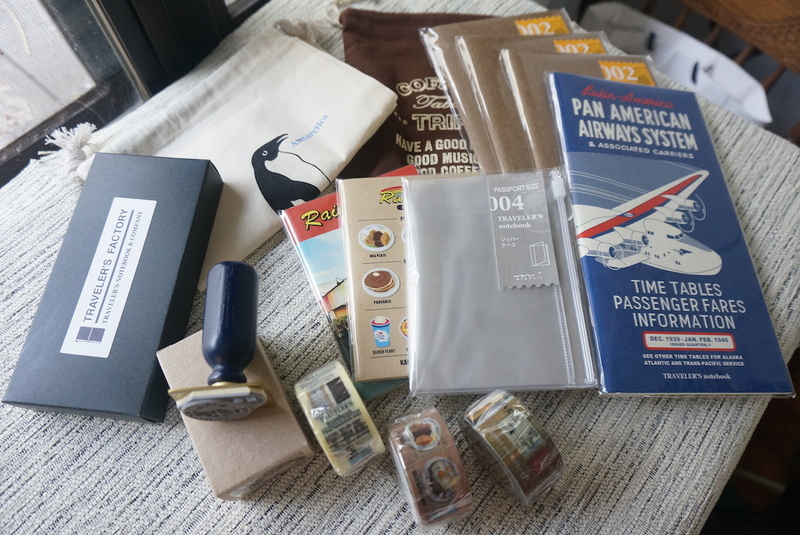 Now that i’ve written the whole post, I feel crazy and giddy over the things I got. 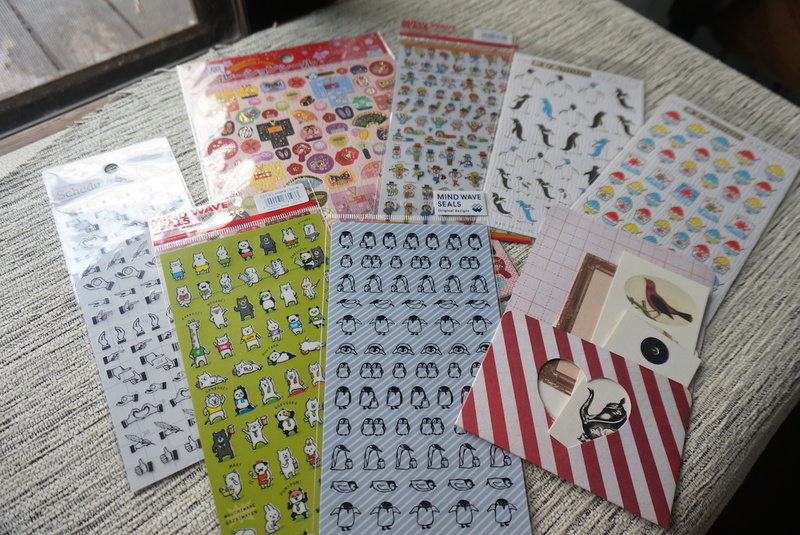 My only excuse is that I won’t be able to get more of these things in a long long time :D. When things are not so crazy in my schedule, I will be putting up my list of stationery places to visit in Tokyo! Thank you so much for this post! What an amazing haul! 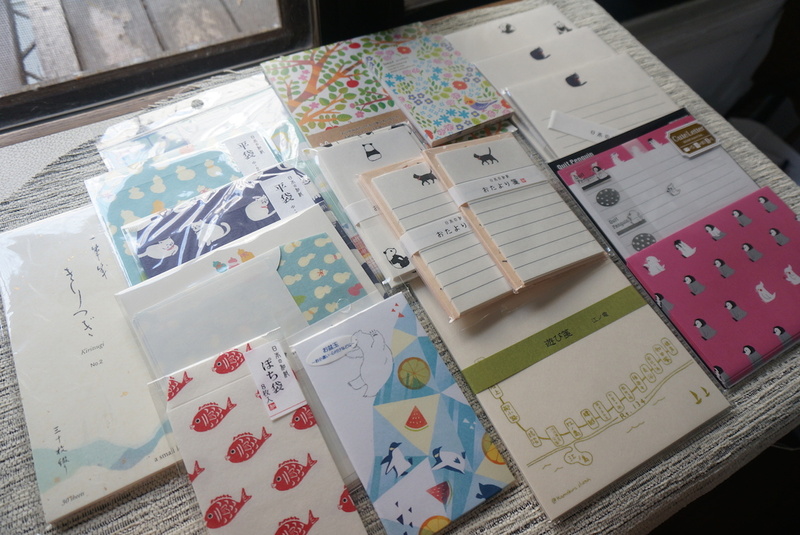 I fully intend to take notes because next year I will be visiting Japan and the thought of the multitude of stationery havens there can be overwhelming. 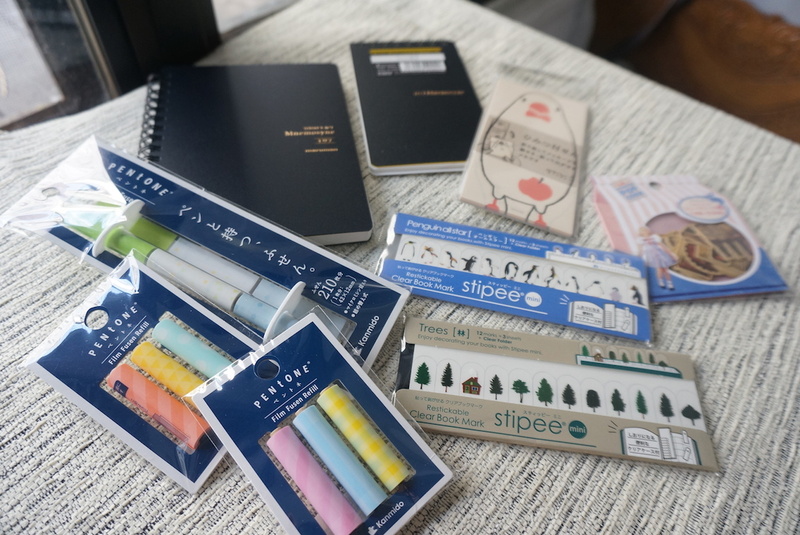 Japan is definitely the place to go if you are a stationery addict like me! I envy you and your pending trip!! !